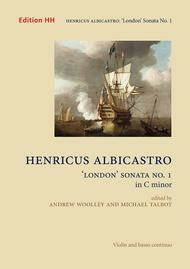 Composed by Henricus Albicastro (1700-1706). Edited by Michael Talbot / Andrew Woolley. Full score and parts. Duration 9 minutes. Published by Edition HH Music Publishers (HH.HH415-FSP). ISBN 978 1 910359 30 3. The present work belongs to a group of four violin sonatas by Albicastro included in a manuscript anthology of 66 violin sonatas by at least 15 different composers copied in England c.1705. It consists of four movements in the tempo-sequence slow - fast - slow - fast: the 'classic' structure associated especially with Corelli's trio sonatas in da chiesa style. The slow movements are lyrical, the fast movements energetically contrapuntal (in this instance, with hardly any recourse to double-stopping). Several hallmarks of Albicastro's style are present, including suave Corellian counterpoint in the second movement (a canzona-type subject is pitted against an elaboration, mostly in semiquavers, of a 'circle of fifths'-type progression), inter-movement quotation, and harmonic experimentation.